A 65 year old man presents to the Emergency Department with a 1 week of cough and left sided chest pain. The pain is intermittent but worse at night when lying down. It is not exacerbated by activity. The patient is experiencing shortness of breath when the chest pain comes on. He has had subjective fevers and a dry non productive cough. He has chronic right lower leg swelling but no pain. There is no history of DVT or family history of thrombophilia. His past history includes paroxysmal AF and hypertension. On examination his RR is 30, saturations 93% on 4l using nasal prongs. His HR is 94/min and his BP 115/56, temperature 36.5. There are a few crackles at his right base and some reduced air entry at his left base on auscultation. 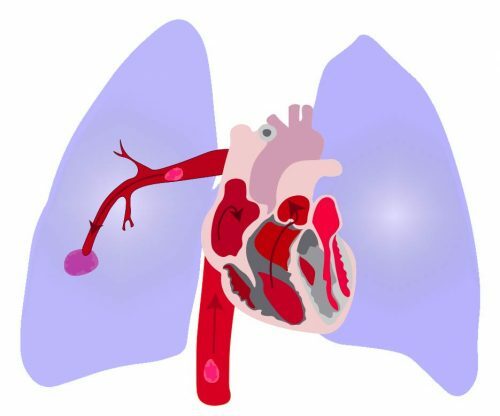 In view of his unremarkable chest Xray and the abscence of fever, an ECHO is performed to look for right heart strain in the context of a possible PE or evidence of a pericardial effusion in the context of a pericarditis. This is his PLAX. His LV is small. His RV large in comparaison. This is his 4C view. The RV is dilated and McConnell’s sign is present. There is evidence of right heart strain on this basic ECHO. A PE is to be excluded. 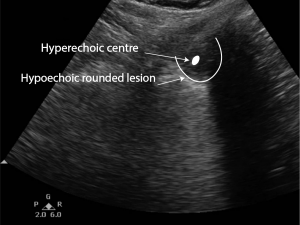 A lung ultrasound is performed which shows a hypoechoic lesion at the left base. It has a hyperechoic centre. The diagnosis of PE was made on ECHO in conjunction with the history and confirmed with a CT angiogram. The lung ultrasound was nevertheless interesting. The use of ultrasound for detection of PE was first described 40 years ago, largely ignored and then “rediscovered” 20 years ago (4). Lung ultrasound is not the best imaging modality for the diagnosis of PE but, in the acute situation, may be helpful. 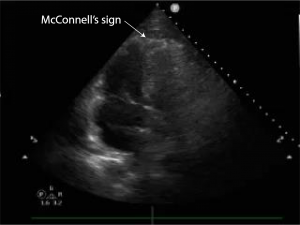 Teaching point: Lung ultrasound is not the best modality to diagnose pulmonary embolism. CTPA is be the diagnostic modality of choice. 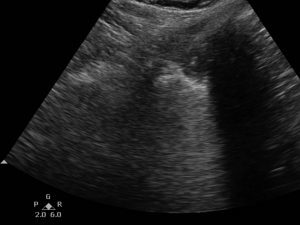 In situations where clinical suspicion is high and CTPA is not available then ultrasound may be a valuable adjunct to confirm the diagnosis along with venous Doppler studies and ECHO. 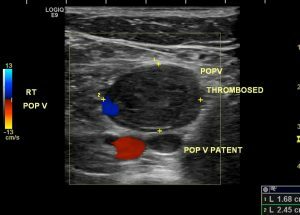 Thoracic ultrasound for diagnosing pulmonary embolism: a prospective multicenter study of 352 patients. Mathis G1, Blank W, Reissig A, Lechleitner P, Reuss J, Schuler A, Beckh S.
Ann Thorac Med. 2013 Apr-Jun; 8(2): 99–104. Sonography of lung and pleura in pulmonary embolism: sonomorphologic characterization and comparison with spiral CT scanning. Reissig A1, Heyne JP, Kroegel C.
This entry was posted in Cases, Lung, Consolidation. Bookmark the permalink.